Graduates are eligible to apply for admission to different degree programmes offered by local universities (including HKU) through non-JUPAS means. The academic progression pathways will include LLB programmes offered locally and overseas. Holders of HKU SPACE’s Higher Diploma satisfy the general entrance requirements of the University of London External System. However, the University of London External System reserves the right to request applicants to provide evidence acceptable to the University of oral and written competence in English before an offer of registration can be made. The Higher Diploma for Legal Executives (HDLE) is recognised by the Institute of Paralegals (IOP), the UK professional body for paralegals which sets national competency standards for paralegals and others. Successful completion of this programme will allow students to be elected to “Associate Paralegal” (A.Inst.Pa.) status; thereafter graduates can obtain “Qualified Paralegal” (Q.Inst.Pa.) status with over 6 years' worth of legal practice experience (LPE). Fellow of the IOP can be obtained by those who have at least 7.5 years' worth of LPE. 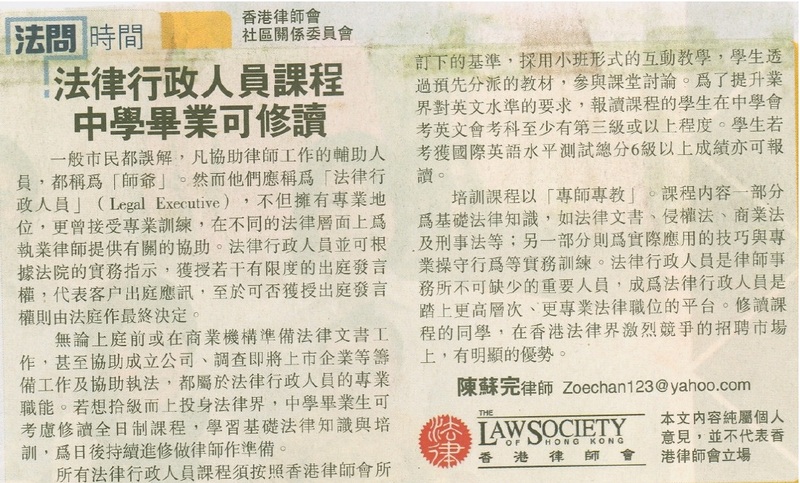 Under the Law Society of Hong Kong’s Benchmarks#, HDLE graduates will be eligible to use the title “Legal Executive”. - Overall score of 6 or above in IELTS (International English Language Testing System). HDLE graduates can apply for Paper F4 exemption from the Association of Chartered Certified Accountants (ACCA).